In Search of My Mother's Garden: "HAVE YOU LOST YOUR MIND?" I was mesmerized, I tried to avert my glaze but I could not resist. It called to me, "you need me". I asked the young lady "how much for the giant buddha head" fully anticipating that it was well beyond what I was willing or able to pay. She told me the original price was right at $900 but because it had a crack at the base of the neck that it had been reduced to $400. My interest immediately heightened when she added, " but I think he (the manager) might reduce it some more". Not wanting to appear too eager, I told her I was might be interested in buying it if the price was right. She took my name and number and told me she would speak with the manager the next morning and let me know. True to her word the next day she called and told me that I could have it for $200. I could not believe it, I was prepared to pay the asking price from the day before. Calmly I told her that the price was agreeable and that I would be there shortly with my truck to pick it up. After hanging up, I jumped up and down for a minute relishing the thought of bringing home my new treasure. Cynthia accompanied me to pick up "The Buddha" . 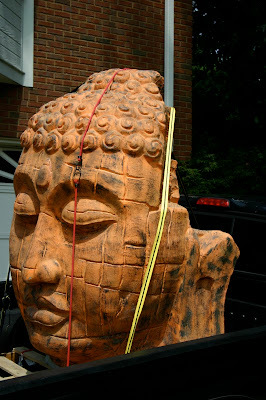 On the way, I explained to her why I thought we "really needed" this fantastic piece of art for the backyard renovations we have been planning, and how perfect the "Buddha" could be incorporated with the future Koi pond and what a unique focal point it would be in the landscape, and let's face it, who else has one of these?. As Mike on American Pickers says "I had to have it". Alas, Cynthia took piety on me and relented without me having to grovel and beg. I have a feeling that somewhere down the road I will pay for the granting of this wish. I had been told that it was constructed of fiberglass so I assumed that it would not be very heavy. Boy was I wrong! Apparently it is constructed of fiberglass and concrete and possibly lead. It stood on a display platform about 12 feet off the ground and after securing it to it's pallet it was removed from it's lofty perch with the aid of a forklift. They then deposited it in the back of my pickup truck and I strapped it down for the trip home. Needless to say, we drew quite a bit of attention on our trip home. Safely arriving at home, I then discovered the true mass of by beloved "treasure". I wanted to see if I could move it a little on the pallet to determine if it could be unloaded manually without the aid of heavy equipment. I could not budge it an inch. It must weigh 400 or 500 lbs! That was last week. It is still in the back of my truck and I am beginning to fear for my life. I had hoped that I could muster enough fellow idiots that we could somehow lift it from the truck but everyone suddenly has something or somewhere else to be. Cynthia who has not needed the truck for two years now must have it before the end of this week. "I am really getting stressed" about the whole situation. We have talked with a local Landscape company about contracting for the Koi pond project and helping us unload the "focal point" of the proposed project in the driveway until we move it to it's final resting place. They told us they could probably come this afternoon and remove it from the truck. They did not show! Plan B: I have borrowed my friend's trailer, purchased a hitch for the truck and am prepared to return to the store tomorrow afternoon after work and have them transfer the "Treasure" from the truck to the trailer. My friend has assured me that he has no immediate need for the trailer and that I can keep it as long as I like. This plan will solve the immediate problem of freeing the truck so that Cynthia can use it, and secondly, it will be easier to remove from a trailer than the truck. Hopefully, the landscape people will show tomorrow and remove it which would be the easiest option. If not, Plan B will go into effect. Either way wish me luck. If I don't get this resolved this week, the next post will probably be made posthumously. I am not into Asian art, but I will say this: Although your sculpture is made of fiberglass, it was a steal! For that price, you have to buy it! It's a once in a lifetime opportunity. Great find, and enjoy it! I am happy to report that I am still among the living. 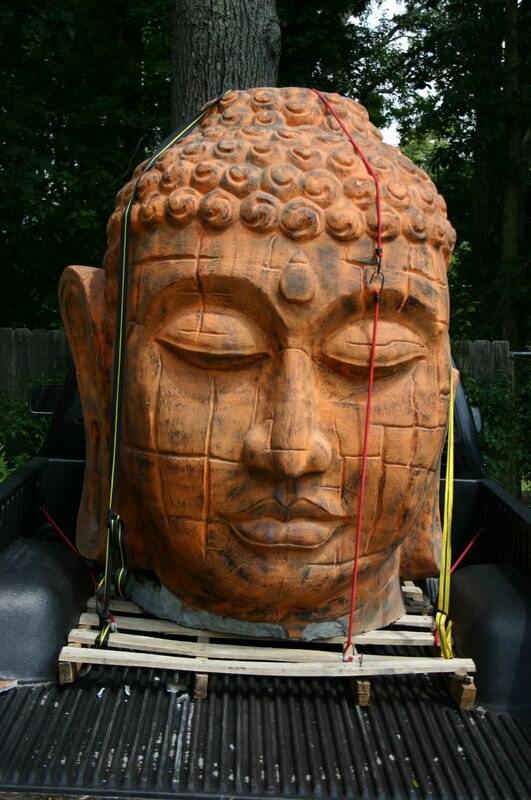 I had to resort to Option B and have the store transfer "Buddha" from the truck to a trailer. All went well and Cynthia is happy for the time being. I have never been able to resist a "deal" and buy things I probably don't need. I hope it turns out as good as I think it might in the new landscape project. Thanks for the comments. Yes, it had to be done. All will come right in the end. It will look fab installed in your garden. Is the Budhda going to the new house? I want an update on the Buddha story -- really funny. I knew it was going to be good from the title, "Have you lost your mind?" Yes Buddha will definitely move to the new house. I am currently trying to recruit additional victims to help me move it again. I have bought a riding lawn mower and might resort to dragging it on the trailer if all else fails. Wish me luck. I'm wishing you luck AND funny adventures with the Buddha. Good thing you didn't get around to installing him at the old house.